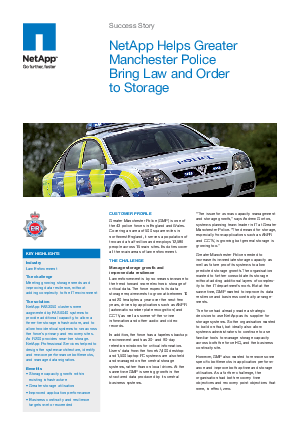 Greater Manchester Police needed to increase its immediate storage capacity as well as future proof its systems to allow predicted storage growth. The organisation wanted to further consolidate its storage without adding additional layers of complexity to the IT department's work. But at the same time, GMP wanted to improve its data resilience and business continuity arrangements. The force had already made a strategic decision to use NetApp as its supplier for storage systems. So the organisation wanted to build on that, but ideally also allow systems administrators to continue to use familiar tools to manage storage capacity across both the force HQ, and the business continuity site.